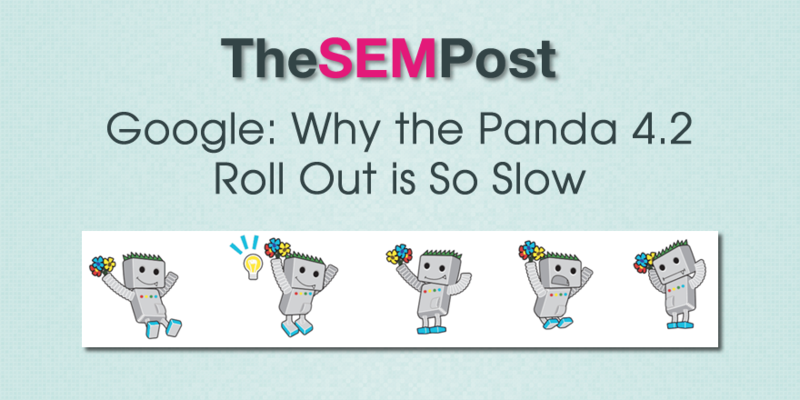 There has been a lot of talk about how slow this latest Panda update is, with the roll out expected to last months. It has been so slow, in fact, that it isn’t even registering on the popular “algo weather” apps, such as Mozcast. There has also been a lot of speculation as to the reasons why Google is taking such a slow approach to this latest Panda 4.2 update, which is technically not an update but just a refresh. We have been told by Google that the “Panda update that will roll out over the coming months” but just how many months that will be isn’t known at this time. But many are wondering if we will see it continue through to a Penguin update, which is also “months away” which will really make things interesting for those who love to analyze various Google updates. John Mueller hosted a Google Webmaster Office Hours and he was asked about the Panda refresh a couple of different times. This is actually pretty much a similar update to before. For technical reasons, we are mostly rolling out a bit slower. It’s not that we are trying to, I don’t know, confuse people with this, it’s really just for technical reasons. When asked whether the slowness was related to feedback during the rollout, he said no. No. This is really just an internal technical problem that we’re rolling this out slowly for. It’s not that we are making this problem slower by design, it is really just a technical issue on our side. He was asked for clarification if the slow rollout has any impact on crawling and indexing, and he stated again that this rollout is slow due to technical reasons. It’s not that we’re crawling slowly, we are crawling and indexing normal and using that content as well to recognize higher quality and lower quality sites. But we are rolling this information in a little bit slower way, mostly for technical reasons. There has also been mixed reaction to the slow roll out, varying from those who think it is a great way to not cause mass chaos in the search results over a very short period to those who find the “waiting game” aspect of it quite painful. And while we have seen slow roll outs previously, this one seems be so much slower on a scale we haven’t seen before. But for SEOs in general, it also makes it quite difficult to analyze the “winners and losers” as well as the ability to see patterns around those who are recovering from low quality content related penalties. For myself and others who study algo changes, it has been definitely harder to analyze the changes from Panda 4.2 than any other previous Google algo update. While we don’t exactly know what the “technical reasons” are, it is nice to see Google acknowledging why this roll out is going to take months rather than days or weeks. But it is due to those technical reasons why we are seeing such a slow Panda refresh this time around. Just confirms to me that the system is now on the edge of completely broken, as I had suspected. Google’s gotten to complex and unless they revamp from the ground up, this is only likely to become the normal path in the future. The only other possible reason I can come up with is that they internally know they screwed way too many legitimate sites that shouldn’t have been targeted previously and this time they’re attempting to avoid that. Through manual micro-increments. All just speculation of course.